I am losing track of my days. It's already Friday, November 16, 2007 and that means I have to get ready for my second investigation of the legendary Hotel Leger (pronounced Lu Zhay) in Mokelumne Hill. See their website at: http://www.hotelleger.com/ The gorgeous Autumn Devich, manager of the Hotel Leger, is preparing for my follow-up story of this very historic hotel. The Leger once was a courthouse, jail and even had a place out back to hang criminals. With this follow-up, I get to spend the whole night in Room 7, George Leger's room (one of the most haunted rooms in the hotel) by myself, while paranormal investigators/scouts Shannon 'Ms. Macabre' McCabe - President of HPI, Chris Grissom - Technician and Tim Hawkins - Lead Investigator of Group B. They will be staying in Room 11, the second most haunted room. Chris only gets to stay for a little while, because he has to work the following day. Autumn set us up with an awesome price for our hotel rooms, they are FREE! Thank you Autumn, you are the best! Will I find my Room "1408"? Hmmm…let's see... I love this gold mining town that was founded in 1848. I hope to encounter George Leger's ghost or the Lady in White ghost that haunt this hotel. George is known to hang out at the saloon and some of the rooms. There even have been noises of ghostly children too, so let's see how this investigation goes! First off, I got my vehicle the 'Ghost Tracker' filled up with some prime gas and picked up Shannon, Tim and Chris. It was a treat for Shannon, Tim and Chris to ride in this jazzy sportscar and I threw on the theme to X-Files for them. Of course, they were all complaining on how cramped they felt in my car and I sort of tuned out their complaints, so I could concentrate on the investigation tonight. As we arrived the lobby was filled with a great crowd of people playing pool, having drinks at the bar and enjoying the inside décor of this historic hotel. I introduced myself to the lovely bartender named Jennifer Sanders-Metzger, she has been working at this hotel for 3 years. Clairvoyance runs in her family and she is a clairvoyant herself. So the first thing she did was introduce herself to the entities of this hotel. The entities have been known to toy with people in this establishment, they are sort of mischievous at times. One night when she was closing down the hotel, she saw from her peripheral vision figures of light moving around. Another time, she was setting up a plate setting and walked away. The manager told her to set the plate setting, because it hasn't been done. She knew she set the plate setting, but did it a second time. The second time around after she walked away, the plate setting was missing again. She did it a third time and asked the ghosts to stop playing these games and they finally stopped. Another time, these three kids were playing with their bouncy balls. The balls disappeared and were found later by the fireplace upstairs in one of the rooms, in the shape of a triangle. When Jennifer was closing down the beer room, she saw the bottom of a phantom dress swoosh by her, it was a light colored dress and she was quite startled from this partial apparition. Sometimes the entities will hold the door knob, while she is trying to open a door. Jennifer tells me that when a woman named Debbie actually lived downstairs in the hotel, she would tell George Leger - owner of the hotel to turn the heat on, because it was cold. When asking George Leger (George Leger was the owner of this establishment back in the 1800s - so he has been deceased for a long time) to turn on the heat, a blast of hot air swept the room. One time Debbie was cleaning up after a New Year's Party and the champagne bottles were mysteriously lined up at each hotel room door with party hats placed on top of the champagne bottles. This was done by some unseen entity. As Jennifer started serving other customers with drinks, I noticed a smiling blonde at the end of the bar. I introduced myself to Trae Parker, a regular customer of this establishment. Trae tells me that she has lived two years in this town. She has seen phantom corpses hanging from the trees out back of the hotel. Trae is quite the character, she calls herself the princess of Mokelumne Hill and she is a 'sensitive'. When she called herself a princess, she had a sly grin on her face. She is able to talk on her portable telephone, because she lives about a block away from the hotel and brings her portable telephone to the bar. Her home is located at Spooky Hollow/China Gulch, which is next to the local cemetery. She tells me that her house is haunted. At times she has felt bound and trapped in her home and she can hear phantom footsteps throughout her house. There has been pictures removed from her house and at times she feels like a female angel follows her to protect her from other unseen forces. She tells me that she assisted police in the woodchipper murder of a woman named Cindy Vanderheim. She goes on to tell me that the population of Mokelumne Hill is 600, but they have 60, 000 people buried in this town. There is more dead, than living in this town, she proclaims. She has heard stories from guests of this hotel, where they say that blankets have been held around their bodies and they are unable to leave the bed due to the restriction from the held tight blankets. This gold mining town was involved in the French/Chilean War, in which militia was called up to fight in this war. Sometimes up to 5 people a day were murdered on the streets of Mokelumne Hill. Bob Barnes, retired Colonel of the California State Military Reserve (US Army) confirms Trae's story. I met another regular of this establishment, her name is Mary McCartney. She tells me she opened up a door, where the old jail was located and felt a cold breeze as soon as she opened the door. When this happened, she felt a fluttering on her chest. She goes on to elaborate that her ancestors are from this town. So just perhaps, some of her ancestors haunt this hotel and town too. She now lives in the old family home and she can feel the presence of her grandfather and other ancestors in her home. She also witnessed a bottle being knocked down in the bar area by an unseen force. While I was making my interviews, Shannon, Chris and Tim were busy checking out various areas of the hotels, trying to gather EVPs and digital photos of anything that could be considered paranormal. Shannon makes contact with paranormal investigator/Vice President of HPI John Wachter, aka Vlawde. Vlawde is a lead investigator for Team A and they are conducting a residential haunting investigation this evening. Team A consists of John Wachter, Alicia Perry, Mary Casiano and Jennifer Baca. They are working on a home cleansing and to make the owners of this residence comfortable in their surroundings. On this night Team A and Team B in two different locations, are in constant communication via cellular phone to discuss any findings. Cheri Garamendi, bartender of this establishment told me that she has felt strange things in this hotel too, but didn't elaborate because she was so busy waiting on customers at the bar. I learn that Cheri Garamendi is the relative of US Politician John Raymond Garamendi, who resides in this County. Samuel Andahl the dishwasher has heard things falling numerous times and when investigating, there was no one around to cause these objects to fall to the ground. Finally it was getting late and it was time to head back to our rooms. This night we were equipped with two video cameras, 4 digital cameras, 3 electronic digital audio recorders and 1 Listen Up sound enhancer. I don't know all the results yet, so let's see what Shannon says in her FINDINGS and CONCLUSION part of this article. Trae Parker came by my hotel room and as soon as she walked in she felt a heaviness on her chest. It bothered her so much, she had to immediately exit my room. I'm not a sensitive, so I didn't feel what she was feeling. In fact I fell asleep comfortably in my bed with warm quilts and soft pillows. About 3:06am, I heard footsteps approach my bed. There were 5 steps that seemed to come from the door towards my bed. At 4:16am, my bed vibrated slightly, then stopped. Now to debunk my own experience, perhaps the footstep sounds were not emanating from my room, but from an occupied room near my room, and perhaps the vibrating of my bed came from people walking outside of my room? I am not going to say that what I experienced was truly paranormal, just maybe it was something from my own half asleep groggy imagination. But, who can say what I experienced is real or not real? In the morning, I checked on Shannon and Tim. Shannon and Tim experienced absolutely nothing in their room. As we left this historic hotel, I can see why people want to stop and see this hotel, this whole town is full of history. This hotel is the legacy of this town's history. In the morning, we cramped inside my vehicle the 'Ghost Tracker' and stopped off at the Odd Fellows Cemetery and Sutter Creek City Cemetery circa for both: 1854. I noticed when I left the Hotel Leger there were an unusual amount of chem trails in the sky. Chem trails that zig zagged, if I was an investigator for chem trails, I would have liked to looked into this unusual display more, but I had to get the Shannon and Tim home. We stopped off at Denny's in Jackson and talked about our investigation of the Hotel Leger. "I enjoyed reading your well done website. My daughter and I recently went to Hotel Leger in Mokelumne Hill ca. We not only got numerous orbs but a figure of a woman in an oval mirror in room eight an otherwise plain unremarkable room. To the naked eye there is no marks, nothing on the wall or the mirror but the little digital camera screen kept showing what looked like a star. My daughter Jennifer was drawn to the room again and again, she always feels them as do I. In one shot she is drawn directly to the wall, looking that way, feeling her but not seeing her or having a clue until we got home late that night and downloaded photos onto an old 50 inch screen TV. It was quite shocking to see a pretty obvious woman in the mirror. We got interested in this hotel after Jennifer attended a wedding there three weeks ago and came home with photos of orbs. While in one of the rooms with Becky her sister, Jennifer was standing near her, both getting ready for the wedding, the window slammed shut and the door creaked. Jennifer decided maybe she wouldn't spend the night, instead Becky and husband did but didn't comment on hearing or seeing things. There was one or two orbs in their room on the photos Jennifer took. I was very interested in the photos she had so I went with Jennifer and a young coworker of hers last Saturday. The downstairs room was a jail and prior to that a dungeon with a hanging tree out back. The town has an extremely violent past, I would say both Jennifer, myself and the young gal Dani that was with us feel the whole town is at unrest. After talking to a gal who works for the hotel and has always lived in Mokelumne Hill I felt our feeling were validated. The hotel worker said there is a balance of bad and good energy there through out the town and always has been. She states some nights it feels so thick she won't step outside. While taking pictures in the dark creepy basement-jail I silently asked anyone to step forward and the orbs were not only around the air they are on my clothing. Just recently one of the guest of the bridal party, a sister to the bride, Jennifer and I don't know her, we just heard the story she was terrified of a woman in the room. Finally after going through my oldest daughter who went through the bride then to the sister Tracy for the photo it was sent to Jennifer and myself and we were shocked to see her photo of room eight is exactly the same as ours, only difference was hers was shot during the middle of the night in the dark and ours in late afternoon before it got dark. She picked up the lady in the mirror too. It's quite clear on the big screen on our photo. Since you are into this kind of thing I thought you would find it interesting. I am not terribly computer proficient so am sending the third and fourth party email photo from the lady Tracy to you by doing a forward. "Hi again; her name was Virginia (Ginger) Mochel, she is my mom's little sister. She was 35 when it happened (In 1980, July, I think), I was just 13. She was a bartender at the Sail Inn/1522 W. Jefferson Blvd, West Sacramento and had just closed it for the night and had gotten into her car when Gallego came up to her car window and pointed a gun at her. He had been in the bar earlier that night and saw her. So just her car was left in the lot and she never came home, so the babysitter called police (She had a 4-year-old son, Glenn Mochel, and a 9-year-old girl, Michelle Rubalcava). They took her in their van and I understand after she was assaulted, was killed (Charlene testified that she was angry and defiant and told him to just kill her; also, I once read she wanted to call her children to say goodbye). They tied her up with fishing line, and when they found her some months later, detectives remembered that Charlene had told them they'd gone fishing that day (they were initially questioned in the missing-persons investigation). So that helped catch them. It was a horrendous and devastating thing for my mom to lose her little sister, and also, we were kept from the children by their father, who also was an early suspect. (They were divorced). So we lost that whole part of the family. It's been sad to see my mom go through that, but she hides a lot and seems very strong. Mostly I wish she could see the two children again and have them forgive us all for seeming not to contact them (the mail was returned by Michelle's father) Thank you again. I think she is in heaven too. I hope it's not just that I need to think that, but that she really is. Elizabeth "
Dana and Jennifer were equipped with two electronic digital audio recorders for EVPs and two digital cameras. We jumped in the Ghost Tracker and headed off to the Old Historic Broadway Cemetery first. They have read about this cemetery and wanted to see the cemetery for themselves. I interviewed two ground workers Ashley Fortune and Andrew Pisansky of the NCCC Americorps. I asked them if they have witnessed anything paranormal at this cemetery and both said "no". We left the cemetery and went straight to the Sail Inn in West Sacramento. I used my Listen Up sound enhancer and tried to make contact with Virginia (Ginger) Mochel, while Dana and Jennifer tried to record EVPs and took pictures around this bar. We were undercover, because the bar was full with patrons and we didn't want to make it obvious. Due to the traffic noise and patrons talking, I was unable to establish any paranormal communication with Virginia. All of the photographs were normal and showed no signs of residual haunting activity. Jennifer did her own research on the Gallegos and said that Virginia was kidnapped at this site and taken 20 miles down the road and finally murdered. Due to this fact, the residual haunting activity would most likely extend from Sail Inn (Point A) to murder location 20 miles away (Point B). I decided the best time to actually investigate this site would be after the bar closed and there is less traffic. There is too much noise interference to conduct a good investigation. We left and since Dana and Jennifer traveled all the way from Lathop to conduct this preliminary scouting mission, I figured I better give them a fun scouting mission, so I decided to stop off at the house on 22nd and H Street. Both were excited, looking at the gargoyles of this old home, as they snapped pictures of this house, they were getting orb shots everywhere. Jennifer even got a picture of what looked like a white mist leaving the 2nd floor window. I was shocked to see so many people driving by the house, snapping pictures and discovered that people have been reading my past article about this house. Case example, I interviewed Carrine Hansen and her mother Goria Hill, they read my article and had to see this house for themselves, they told me that they even read my I-5 Killer article about the murder site at I-5/Sutterville. (I took Dana and Jennifer to I-5/Sutterville too). I told Carrine and Goria that I will be taking Dana and Jennifer to Doreathea Puente's F Street Boarding House. Carrine asks "can I follow you over there?" I smiled and said "more the merrier". We stopped at the F Street Boarding House and there were crows flying all around this house, which made the house even more spookier. The 4 ladies that I brought over here, started snapping pictures and got some excellent orb pictures at this house. 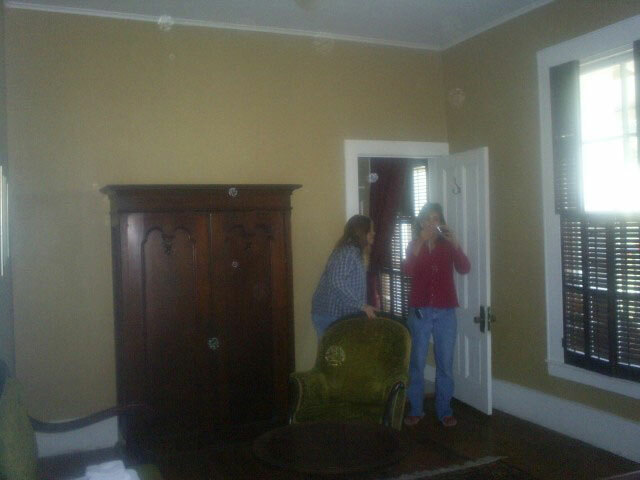 One of Jennifer's photos showed 8 orbs around the house. Coincidentally, there were 8 makeshift graves at this house. As they were taking pictures, Robert Gordon a neighbor to this house asked what we were doing. I told him that we were paranormal investigators and I was a journalist. With a smile on his face he took me over to his house. I met his lovely wife Karisten Lockhart and she told me about the paranormal activity in their own home. I asked them if I could conduct an investigation and they said "yes". Robert Gordon read the Sacramento News and Review account of my previous investigation of the F Street Boarding House and was impressed with the report, he was now ready to have an investigation of his own home. As I left Robert and Karisten, I gathered up Dana, Jennifer, Carrine and Goria and took them to the Sacramento Theater Company and from the pictures they took, they got some more orb shots at this G Street location. Finally Carrine and Goria headed home and Dana and Jennifer treated me to dinner at the Tower Café. I debriefed them about the scouting mission and afterwards with a smile, I told them that the Tower Café is next to the Tower Theater, which is supposingly haunted. Jennifer snaps a few photos of the theater. As I thanked them for my dinner, I asked if they had a satisfying day of scouting and both were very pleased. They were both tired and now have a long drive back to Lathrop. I would say it was a fulfilling weekend of ghost hunting. Now let's find out what Shannon has to say about the Leger Hotel. Shannon, take it away! FINDINGS: I still need to go over numerous hours of video and audio. I did not experience anything first hand, but who's to say there won't be an EVP or something on the video. Stay tuned. SHANNON'S CONCLUSION: With all the stories from the Hotel Leger's staff I would give this place a 7 on the Spook Meter! first things first. The first thing is, that story was NOT true and was SOOO lame! Why do you think a kind of story like that would scare anybody? It would make a newborn baby laugh! Ha, HA! Make different stories. (and make them true)! Hi there Paul. Kinda stumbled on this site looking for pictures of Mokelumne Hill, and I just thought I would somewhat validate your story. I used to live in a small apartment under the Hotel Leger when I was a kid. My mother worked as a bartender at the hotel as well as a waitress for the French restaurant that used to be there. She used to tell me about a ghost named "George" that lived in the hotel. 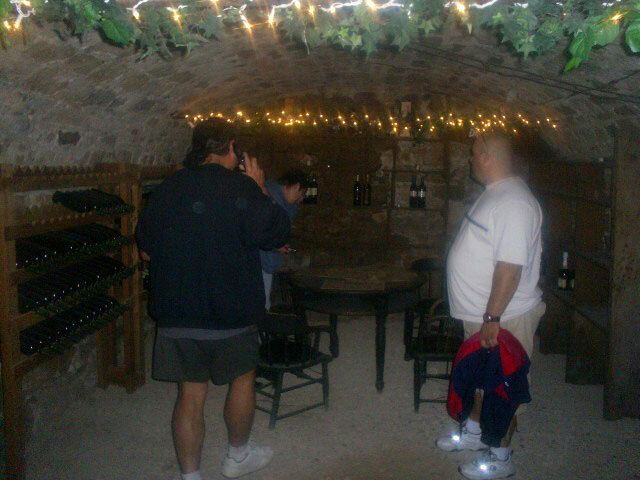 She said he would make the cash register ring in the middle of the night and that she, or somebody she worked with, heard him laughing in the wine cellar. That gave me chills to read that someone else has actually heard of George so many years later. I love to read about your investigations, Paul. Thank you for another well written account of the happenings here. Keep us informed! Hi, Paul. An interesting and busy weekend for you, an interesting and excellent article for me. I also enjoyed the photos. I see what you mean about there being a lot of orbs! I wouldn't mind seeing some of the pics taken at the other stops. I hope you'll give us an account of what takes place at Mr. And Mrs. Gordon's house, I'd love to know. I always enjoy reading about your investigations and I look forward to more. Thanks for sharing your adventures with us. © The ghost story Haunted Leger Hotel / Historic Mokelumne Hill & Gallegos Murder Site is copyrighted to PaulDaleRoberts. Edited by yourghoststories.com.